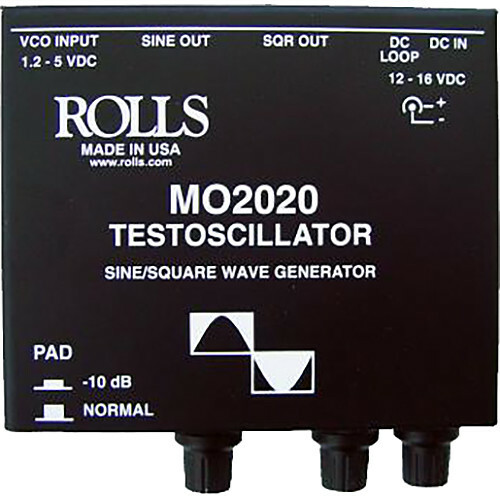 The Rolls MO2020 Test Tone Generator provides both sine and square wave outputs on two 1/4 in. jacks. The units frequency range is variable from 20Hz to 24kHz and accepts a 1.2 to 5 volt DC VCO input on a 1/4 in. jack for external frequency control. A 10dB Output Pad is also provided to allow for -10dB referencing. Dimensions 4.25 x 3.75 1.75 in. Box Dimensions (LxWxH) 6.9 x 4.7 x 2.5"
MO2020 Testoscillator Wave Generator is rated 5.0 out of 5 by 1. Rated 5 out of 5 by GeoZero from Works Like A Charm Needed a tone generator to test circuits I am designing. The unit is small and easy to use. Rugged construction. Comes with power supply!! Wish it had an on/off switch. How would one go about attaching the test tone oscillator to a speaker/subwoofer? Attach speaker wires to a phone jack. Insert jack into SIne out or SQR out. Adjust Sine Level or SQR Level for volume. If need more volume insert a pre-amp or amp.